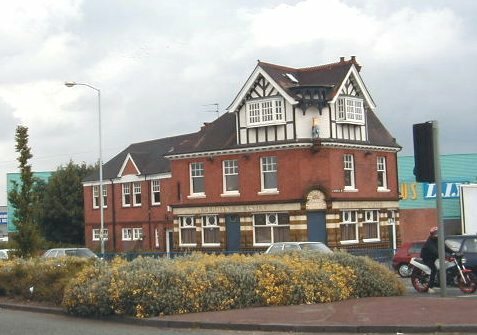 The Elephant and Castle, at the corner of Stafford Street and Cannock Road, was destroyed by Peel Holdings plc on Sunday 4th March 2001. 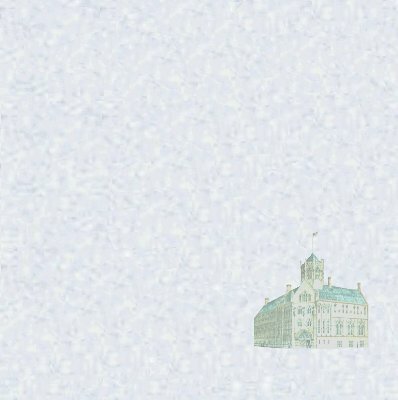 People going by that morning saw the Elephant and Castle still in place; when they came back that evening, it was gone. A report in the Express and Star (5th March 2001) showed that even the statue of the elephant, which stood on a little bracket and under a canopy on the corner, had been destroyed. Not one stick or stone had been preserved. 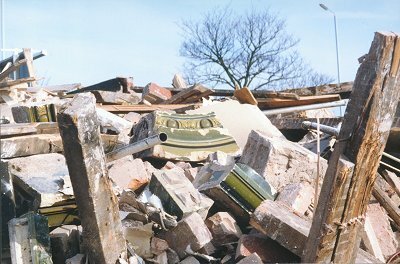 All that was left was part of a brick wall and a heap of rubble. Within a few days even that was gone and the site swept clear. Whether or not the whole issue can be swept under the carpet remains to be seen. This destruction of our history and heritage took place on a Sunday, timed no doubt in the interests of safety, there being fewer people around at that time. Doubtless, too, the fact that the building was under active consideration for listing is merely a coincidence of timing. 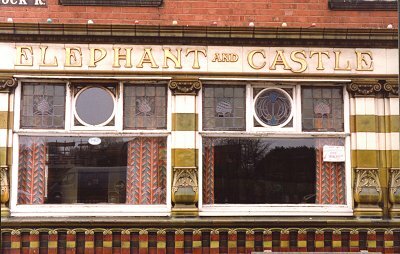 Before Peel Holdings plc: the entrance corner with the elephant and elaborate tiled doorway. 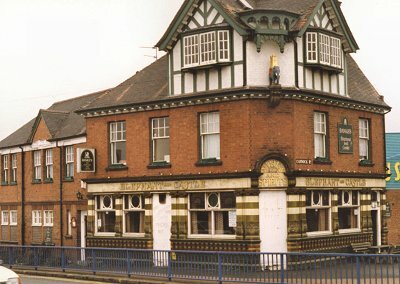 It seems that the pub was sold by Wolverhampton and Dudley Breweries to a firm called Avebury Taverns, who then sold it to another lot called Peel Holdings plc. It seems that Peel Holdings plc own the retail park adjoining the site. Peel Holdings plc is a very large property development company, based at Trafford Park, Manchester. Apparently a major shareholder is an organisation with the name Rothschild in its title. That organisation presumably takes its name from the Rothschild family, one of the most civilised and cultured families of this country. Nothing of their merits seem to have come down to this company. The people immediately responsible for this destruction are, of course, the Board of Directors of Peel Holdings plc. Their names do not appear on the company's web site but are probably easily enough obtainable. But to put a few names to the affair, J. H. Whittaker is the Chairman, R. E. Hough is the Deputy Chairman, P. A. Scott is the Managing Director and P. P. Wainscott is the Secretary and Finance Director. Before Peel Holdings plc: a view of one of the facades. 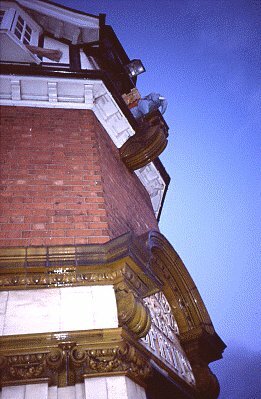 Note the ceramic mouldings, which re-appear later. Their web site does reveal that the company not only bought out the Manchester Ship Canal and the Bridgewater Estates but it also built and owns Trafford Park. If Peel Holdings think that Trafford Park is good architecture it may be that, after all, they really did not realise that the Elephant and Castle was a splendid building. If you also take into account their statement on their web site: "our objective is to maximise returns to shareholders" - with not a word about anyone else's interests - you get some sort of idea of the thinking of the people who destroyed an important part of our history and heritage, destroyed a landmark regarded with much interest and affection and saved not a scrap of it. Several attempts were made to contact Peel Holdings plc. I wrote to them to find out if it really was them that did it, why they did it, why they did it when they did it, how well they recorded the building before destroying it and what plans they have to redevelop the site. Somewhat more importantly, the Chairman of the Wolverhampton History and Heritage Society, on the resolution of the Society's committee, also wrote to them. Neither letter got a reply. The awful possibility arises that Peel Holdings plc may feel that they are not popular round here and had better keep quiet for a while. Surely the row will blow over? And if you can treat the heritage with contempt, what does a little discourtesy matter? But, worse, it now also seems possible that they may not have fully recorded the Elephant and Castle before they smashed it to pieces. 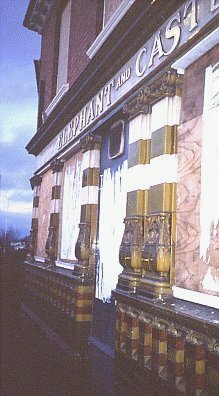 The Elephant and Castle after Peel Holdings plc had dealt with it. The Express and Star (14.03.01), who have been covering this disgraceful event very well, did at least get something out of Peel Holdings plc. They report a spokeswoman for Peel Holdings plc as saying: "It wasn't a listed building and there wasn't any representation in from the local authority for any application for listing". I have no idea of what this spokeswoman means by a "representation ... for any application for listing". Certainly it can not mean that the City Council had not suggested the building should be listed. They had; which was why English Heritage were nosing around. But Peel Holdings plc refused to discuss with the Express and Star their plans for the site. But I am sure, I really am, that whatever they build on the site will be architecture of the highest order and will fully restore their current local standing as the unacceptable face of property developers. The mechanical monster browses on the remains of the Elephant and Castle. At least one person who visited the site hurled abuse at the men working there. She now recognises that it was not really their fault. One or two people have suggested, and a letter later appeared in the paper suggesting, that any application from Peel Holdings plc for planning permission for this site should be refused. A refusal of planning permission on the grounds that Peel Holdings plc have behaved disgracefully would not be legal. And it would also be a bit doubtful to try to demand something extra special on this site on the same grounds. We cannot treat Peel Holdings plc with the contempt they have treated us. That might cause a problem, because when Peel Holdings plc do put in an application to do something about their whole scruffy site, they might be surprised by the standard required; and then they will think that they are being discriminated against. But the reality of the matter is that high standards will be required of any development of this site, not because of Peel Holdings plc's appalling conduct, but because this is an important route into Wolverhampton. The city council has, in recent years, espoused a policy of paying particular attention to major access routes to the town and have already battled to improve at least two recent developments in the immediate vicinity. All power to their elbow. After Peel Holdings plc: the mouldings moulder. The City councillors also come out of this with two more dollops of egg on their faces - but whether or not they will notice I rather doubt. The first dollop arrived because they must have realised that the building was one of architectural or historic interest and was at risk. They could, long ago, have served a building preservation notice which would have prevented demolition. They did not do so. The second dollop arrived because they have recently adversely criticised the listed buildings procedure as undemocratic and lacking in consultation. This is a ridiculous view and they now have a graphic demonstration of what might be the effect of pre-publicising a proposal to list. The Express and Star reported that the WCC says that it has no record of Peel Holdings having given notification under the Building Act of their intention to demolish the Elephant and Castle. Peel Holdings are, apparently, saying that they did give notice. If, in fact, they did not, they may be prosecuted and fined. If a prosecution under the Building Act were to take place and a conviction secured, it might lead to further unfortunate publicity for Peel Holdings plc. Giving notice under the Building Act has got nothing to do with the architectural or historic interest of a building. 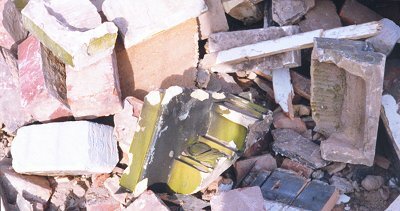 It is about ensuring that demolition takes place safely. It seems a bit odd that WCC were relying on such a notice when they were dealing with the architectural and historic aspects of the building. According to the E&S WCC have now written to the government asking for a change in the law about listed buildings. "This would halt plans for a building while an application to preserve it was being processed". I would guess that they might get a short answer from the government, to the effect that such provisions already exist - the council has to serve a Building Preservation Notice. Despite this, it has to be said the recent record of WCC on historic buildings has been very good, despite the fact that some councillors seem to have weird views on the subject. This has been a horrible glitch and I suspect that the officers of the council feel that they have been hard done by. 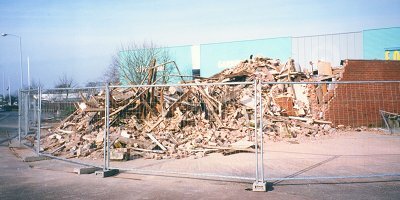 They may have thought that after the Firestone Building fiasco, even property developers like Peel Holdings plc would not do that sort of thing. But the question might also be raised as to what English Heritage thought they were doing. They acted with great speed in the case of Old Merridale Farm but seem not to have done so in this case. They must have guessed that making known a listing proposal might lead to demolition and their request to inspect the interior probably lead to unwanted publicity and certainly lead to delay. There is no reason whatsoever why a building should not be listed without internal inspection and buildings are often so listed. After Peel Holdings plc: the Elephant's graveyard. The Elephant and Castle, a true landmark building, has gone in order to "maximise returns to shareholders" of Peel Holdings plc. What now strikes one with horror is the fact that no one knows, nor has any practicable method of finding out, what other buildings in the City are owned by Peel Holdings plc and may be subjected to their business methods. If anyone wants to try to make contact with the august firm of Peel Holdings plc, their address is Peel Dome, The Trafford Centre, Manchester, M17 8PL; or phone 0161 6298200. Their shares are available through any stockbroker. Addendum September 2003: it is now two and a half years since Peel Holdings destroyed the Elephant and Castle. So far as I am aware no proceedings were ever taken against that company in respect of the alleged failure to serve the Demolition Notice. Why this is so, and where it leaves the company and city council on that matter, I do not know - and no one is saying anything. And, so far as I know, no application to redevelop the site has been received from Peel Holdings or any one else. That seems to show that Peel Holdings had no plans for the site when they wantonly destroyed this landmark; and that there never was an urgency about redevelopment. The site remains a wasteland - an offence to the citizens of Wolverhampton and a symbol of Peel Holding's care for the city. Addendum February 2008: Since 2003 Peel Holdings have been showing fits of interest in the site of the Elephant and Castle and their adjoining retail park. They put in an application for planning permission which showed the whole park updated and given a more modern and unified appearance; and which also showed a large glass fronted building on the site of the Elephant and Castle; and an indication that there would be a work of art in the form of an elephant atop the glass building, or somewhere. Nothing happened on site. Then Peel Holdings declared that they did not think it worthwhile doing anything with the site until the problem of accessibility, caused by the dual carriage way, had been sorted out. For this purpose they proposed replacing the junction of Stafford Street and Cannock Road with a roundabout. Nothing happened. And now we have a recession. In 2006 and 2007 there was much press publicity when someone found the remains of the elephant itself on a dump. He took the bits home and got a friend to restore it. Then, after an unseemly dispute over money with the restorer, he set about selling it, quoting an asking price which seemed to most to unbelievably high. Nothing has been heard since. The photo above has come to light. It is from The Architect and Contract Reporter, 15th June 1906. 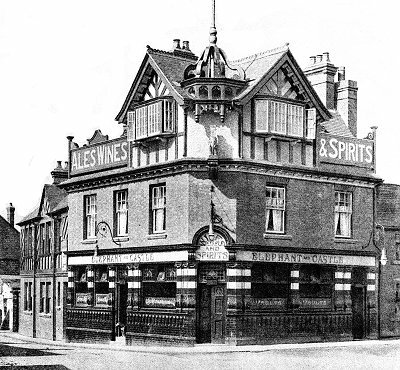 The report (p.384) says that "This is a rebuilding for the Manchester Brewery Co. 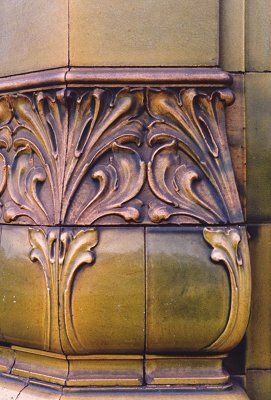 The faience was supplied by Messrs. Gibbs and Canning, the electrical work by W. H. Price & Co. of Walsall; and Messrs. Speake and Son, of Wolverhampton, completed the work from the designs by Messrs. J. F. Hickton, FRIBA, and H. E. Farmer, FRIBA, architects". (Hickton and Farmer were based in Walsall). 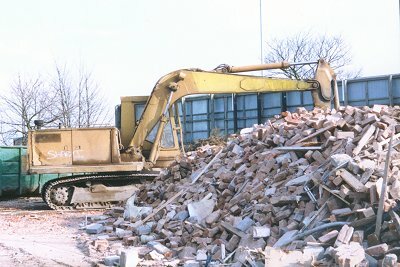 It is interesting that a Manchester firm provided the building and another Manchester firm destroyed it. From the photo you can see that the building remained largely unaltered. Some false timbering has been removed from the Stafford Street facade; and the crown shaped based of the flagpole has been removed, along with the flagpole that, originally, was as high as the building itself. 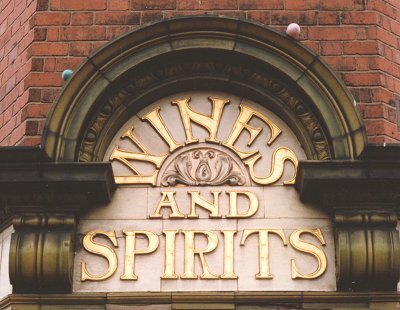 The large signs for "Ales Wines Spirits" are typical of the age but long since gone.